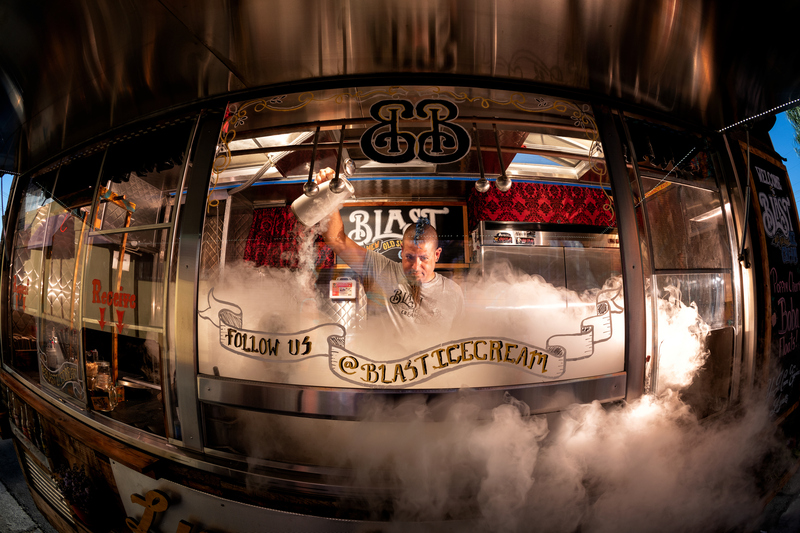 First up was Blast Ice Cream truck – cool looking truck, with a challenging interior to sort out. Saving grace was having a terrific subject, Court Hackworth, who makes ice cream with liquid nitrogen, right there in the truck. The flash freeze of the nitro is so quick, it makes the ice cream really creamy and crazy smooth. He’s got a great look, and of course the vapors make it appear he is creating a weird science experiment in there, as opposed to fruit laden, delicious ice cream. The truck is of course a shiny cube on wheels, which makes lighting an interesting proposition. All Speedlights, SB-5000 units. Two are behind him, one with a warm gel and the other with a deep theatrical blue gel on it. A third, also gelled warm, is up above the mixer with a snooted grid, providing some light for the nitro fog. Outside are two more SB-5000’s, fitted into a brand new Lastolite strip soft box, with a fabric grid. (This soft box is just out, and basically about 1’x6′. Nicely designed, really works. More tk on this shaper, as I will be using it a lot.) The strip nature of the box outside the truck window mimicked the shape of the window itself, so it seemed like a natural thing to do. Below is a BTS pic, shot by Jason Ryan, a good shooter, based in LA, who was kind enough to assist on this series. I shot all the food trucks with a Nikon D850, and in this instance, a 16mm f2.8 fisheye lens. I figured with wonderful subject matter like food trucks, it was time to have some fun and pull out the wilder lenses. Heading to San Fran next and working with the folks at Samy’s for a lively give and take about pictures on Wednesday August 1 (7:00pm – 9:00pm) where we’ll talk about recent shoots like the LA Food Trucks. A fun part of the night will be critique and discussion of pictures sent in by folks who are going to attend. Did it in LA and had a great time. Event tickets here: Town Hall Evening at Samy’s Camera San Francisco. Great stuff as always Joe!! Joe, how absolutely glorious to see you shooting food trucks. Especially for this food industry photographer who looks up to your work immensely. The closest I’ve come to my Joe McNally moment was when I shot a top chef in London, with the magazine owner standing next to me. 1/13 shutter speed, hand held, to draw in some street light and a speedlite in an Ezybox to, hopefully, freeze the subject. All’s I can say is thank the gods of light for flash duration and Canon for awesome IS. The results here of your eye and lighting are always a joy to see. Hopefully I’ll be able to find Samy’s video to watch. Thanks for always sharing, shooting and inspiring. Quite an odd lad this one, but also a nice album subject. Where I come from there is no such thing as a food truck, and thus, the photos got me interested in the blog. https://bit.ly/2yDQnOW – Best photography e-book, sincerely, an amateur from Eastern Europe.